SF Taxi Media: DeSoto's Competition With Green Cab, And An Analysis On Whether Back Seat Tip Prompters Improve Drivers' Incomes. By John Han. DeSoto's Competition With Green Cab, And An Analysis On Whether Back Seat Tip Prompters Improve Drivers' Incomes. By John Han. File photos by John Han. Earlier this year a contest began between the presidents of DeSoto Cab and Green Cab, to see if tips prompted by rear seat passenger information monitors, (PIMs), really increases a driver's tip percentages, thus making drivers more money. Part of the reasoning behind PIMs was that if they were to increase drivers' tip percentages, then 5% credit card charges imposed upon drivers would become a non-issue, since higher income from PIMs would 'more than make up for the credit card costs'. Hansu Kim, DeSoto Cab's president, is and has been one of the industry's most ardent proponent of getting PIMs installed in San Francisco, and for allowing cab drivers to legally incur a 5% credit card cost. On the other hand Mark Gruberg, president of Green Cab, openly opposes rear seat PIMs, and is vociferously against cab companies charging their drivers any amount in credit card fees. Nelson Nygaard, the consulting firm hired to do research on credit card fees and rear seat PIMs, provided preliminary data that suggests tip prompters do indeed increase tip percentages. It cites data provided by DeSoto Cab claiming that PIM tip prompters increase our tips by 3.2%. On the surface, it would seem therefore that DeSoto is winning the contest. But the report cautions that,”shortcomings of the analysis suggest more thorough research is necessary.” (Taxi Study: Credit Card Processing Fees, Back Seat Monitors, and Electronic Waybills, Nelson Nygaard Consulting Associates, December 6th, 2011). If I use myself as an example, I'll say that I had recently completed a fare to SFO with the meter ending at $48.60. The passenger paid by credit card and I used the front seat machine, as there was no rear seat processor. The passenger told me to charge $58.00. That is a tip of $9.40, or 19.3%. Twenty-two-and-a-half percent of $48.60 is a tip of $10.94, making the new total fare $59.54. That's higher than the original $58.00. It's a boost of $1.54 aided by the tip prompter. At first glance it would seem as if I'm doing better now with a tip prompter in this case, despite a 5% credit card chargeback. But here's the important detail not covered by the Nelson Nygaard study... the study that when referencing tip prompters, admits that shortcomings in the analysis means, “more thorough research is necessary”. In a before and after analysis, analysts must remember to deduct the amount of the credit card charge from whatever the total amount of the fare is. So once a 5% credit card fee is charged to the $59.54, (thought to be an increased amount because of tip prompters), the new total is $56.56. That's leaves $1.44 less than the original $58.00. With respects to this contest, analysts must remember that Green Cab drivers are not being charged any credit card fees at all. Also, before the credit card fee waiver kicked in, Yellow and Luxor drivers were not being charged any fees either. ... suppose that a Green Cab driver had the same exact fare, with the same tip... or suppose that I had this fare with Yellow Cab before the credit card waiver kicked in, while we weren't being charged any fees. In either case, either of us would have pocketed the full $58.00 (or whatever the equivalent before the new meter rate). Now under the credit card fee waiver, even with a 3.2% increased tip bringing the aforementioned fare to $59.54, the end result is a lower $56.56 fare because of the 5% charge. Thus, there's a higher tip percentage, but a deficit in earnings, in this case. This second example is not an actual real life example, but is a realistic hypothetical example based on experience. When a fare is for $10.10, (new meter rate), a typical passenger will pay about $12.00 - $13.00, whether it's by cash or by credit card. There are always exceptions like when a tourist or a drunk person throws $20 and says “keep the change”, or when someone is totally cheap and hardly tips at all. But many drivers, I think, would agree that a realistic average on this is about $12.00 or $13.00. Using the example above, if a Green Cab driver finishes a fare for $10.10, and the passenger says to charge their card for $12.00, then the passenger has payed for the fare with a $1.90 tip included. That's a tip percentage of 19%. 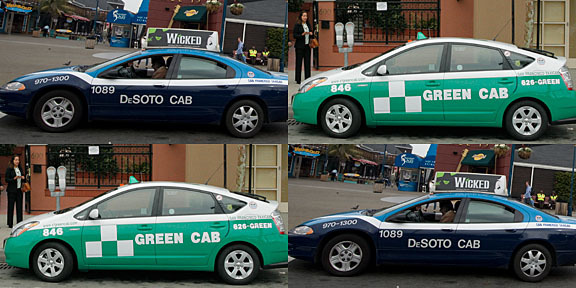 Since Green Cab drivers are not charged credit card fees, the driver earns the full $12.00 on the fare. By contrast, if a DeSoto Cab driver completes the same $10.10 fare, and the passenger selects “20%” on the rear seat PIM, that would yield a tip of $2.02. That brings the fare to $12.12. The difference being that DeSoto Cab drivers are charged a 5% credit card fee. Five percent of $12.12 is sixty-one cents. So after the 5% chargeback, the DeSoto driver now earns $11.51 on the same fare, despite a would be increase of 1% in tips. Therefore, there may sometimes be a difference in meanings between “tip percentages” versus “tip incomes”. The two concepts could be distinguished from one another. Under this scenario, the DeSoto driver comes out the winner with respects to“tip percentages”. But the Green Cab driver ends up ahead with respects to “tip income”. I had four other credit card fares on the same day that I had the SFO fare for $48.60. On that day, the cab had no rear seat machine so the cards were processed in the front seat without tip prompters. As anyone could see, some passengers obviously tip more, and some less. The data that DeSoto provided to Nelson Nygaard and to MTA's Taxi Division showing a 3.2% increase from tip prompters, may have been based on data from only three of DeSoto's cabs, even thought the company has over 100 taxicabs! In case I'm misinterpreting the text, I'll just quote where I'm getting this information from. The quote above is from the report published on the SFMTA website titled, “Taxi Study: Credit Card Processing Fees, Back Seat Monitors, and Electronic Waybills. Final Report”. (Bold and underlined text mine). I hope anyone reading this understands I'm not trying to say that tip prompters absolutely do not increase drivers' incomes. What I am saying is they don't always necessarily live up to the claims to make up for the 5% credit card fees. The Nelson Nygaard report itself says that the current "preliminary data" may be inconclusive. A New York Times article published December 6, 2011 reports that in a survey of 113,000 New Yorkers, "nearly half of taxi riders are not fans of the in-cab TV sets, and 17% of those actually hate them." Still, the article says there's a "good amount" of people who like them. The December survey is the second one this year that indicates a significant portion of the public showing negativity, or at least expressing a lack of enthusiasm for the back seat equipment. The first survey was released in February. In that survey, 22,00 people were polled and nearly one-third considered Taxi Tvs to be the worst part about riding in a taxi. There is also this article from the New York Times published October, 2011. At least back here in our San Francisco, our MTA says it's looking into ways to make sure those monitors stay QUIET, and to dim down the brightness of the monitors, that some say are intrusive at night. Let me say first of all that I am not president of Green Cab. Green doesn't have a president, but Pat McCollum is the general manager. I am the color scheme holder (that is, the company's permit is in my name), and I am one of seven members of the managing board. Although DeSoto agreed to do the comparison, they never produced the numbers, despite our requests. So the contest never took place. But if the figures DeSoto now is claiming are true, it proves that Green drivers do better. A 3.2% boost in tips doesn't compensate for a 5% charge. Thanks for adding clarity Mark. Mark Gruberg's remarks just now are more than mere "clarification." If the backseat terminals only yield a 3% increase, this increase is not paying for the credit card transaction. Therefore the backseat terminals are definately LOSING money for the drivers on credit card transactions. I believe that the best way to reckon the value of the credit card transactions is that they result in an overall increase in the volume of business a driver does. Every business has different profit margins for different products. Cab drivers are being extremely myopic when they insist that all fares' profitability should be the same. The credit card order you drive and make slightly less profit on is one more order you have driven; you didn't have anything else to do at that moment, and more is more. The cab companies are often atrocious on a number of ethical matters, not least of which is their failure to come across with the medical plans they owe the drivers and which the drivers are paying. The MTC is being very slow to enforce the law; they are treating the situation as one that requires "investigation." The law is clear and the delay is culpable. However, on the point of credit card business alone, I disagree with the idea that the companies have an ethical commitment to the drivers. The credit card transactions are not part of the profit stream of the companies in any way. Let me say it this way: if the companies are not benefitting from those transactions, they are not cheating the drivers if they don't pay for the transaction. The CC transactions are entirely the drivers' business. The wickedness here is not coming from the companies; the bad guys here are Visa, who, all by themselves, have prevented the customers from being the ones to pay the fees that their choice of paying method has incurred on the businessmen. A proper action would be to fight the Visa preference. A dollar minimum amount to the CC transactions would mitigate some of the loss for the drivers by passing the fee on to some of the passengers. But in this case the unfairness to the drivers is being remedied by the passengers with the smallest transactions, and if that means the poorest passengers, there is a different ethical problem. The only correct fix is to make all passengers pay equally for their choice of method of payment, to the degree that their transaction involves credit. It is Visa that is preventing the proper ethical solution, not the cab companies. The big bad corporate evildoer is one of the world's biggest banks, a much bigger and badder evildoer than any San Francisco cab company. John, Did Nygaard actually describe the evidence he considered, or did he just swallow DeSoto's ‘data’? Where did DeSoto’s ‘data’ come from? Who and how did they ask about tips prior to the advent of back seat terminals? That would be one squishy survey. Moreover, the primary issue for Green Cab drivers, who overwhelmingly rejected back seat terminals at their last regular members meeting, was the imposition of yet one more stupid, in-your-face gadget on drivers and customers alike, and a noisemaker, to boot. The capital question is how much drivel can we subject our customers -- excuse me, our DRIVERS' customers -- to before they defect to Town Cars? Finally, the fee is not just 5%. There is also the matter of time and access to one's money. Companies like Luxor have made access to one's money an obstacle course, and most, if not all, companies won’t accept authorized receipts toward gate fees. Except Green Cab, I’m proud to say. And why not? The transactions are already approved. Any suggestion of owner concern for drivers accruing from back seat terminals is disingenuous. The Nelson Nygaard report seems to have data from Yellow and DeSoto as it was delivered by the companies. DeSoto reportedly submitted raw data, and Yellow reportedly submitted prepared data. The report publishes what was given by the companies, and then says there are "shortcomings in the analysis" and that "more thorough research is necessary". Hi John, this article is one among the many excellent articles you have written. Thank you for your work. Oh my God, John, you are omniscient! As one of 7,000 drivers in the industry I hope you appreciate your god-like stature--your Word is Fact!